Batman V Superman: Dawn of Justice is the second instalment of the DC Extended Universe series and is a sequel to Man of Steel which first introduced Henry Cavill as Superman. He reprises his role for this film and stars alongside Ben Affleck as Batman. Many of the cast that starred in Man Of Steel also appear in this film including Amy Adams, Lawrence Fishburne and Kevin Costner. The plot centers around the manipulation of both Batman and Superman by villain Lex Luthor who plays on the distrust of each other that both characters have. Superman does not agree with the way the Batman brands his victims and deals out justice, whereas Batman is unsure that Superman can be trusted because he is technically an alien. Superman is called to give evidence in an inquiry as to whether there should be some code of conduct that he needs to adhere to as some people believe that he sees himself as being above the law. Lex Luthor engineers a bomb to go off at the hearing and Superman is the only survivor. Believing that he should have done to more to save people in the building he goes into exile and only returns when Lex Luthor takes his mother hostage. A fight ensues between him and Batman and only ends when he begs Batman to save Martha, the name that was shared by both their mothers. Lois Lane explains the situation to Batman and they are both able to see that they have been manipulated and are both actually on the same side. The finale of the film sees Batman, Superman and Wonder Woman teaming up to fight a genetically modified monster that has been created by Lex Luthor. During the battle Superman realises that kryptonite is the creatures weakness and risks his own life by impaling the creature with a spear made from kryptonite. He manages to kill the creature but is fatally wounded in the process. A funeral is held for Clark Kent in Smallville and the last shot of the film sees the dirt on the top of the casket begin to levitate, hinting that he may well still be alive. The Dawn of Justice part of the title comes from the fact that this is the first film where the formation of the Justice League is hinted at. At the end of the film Batman and Wonder Woman team up with the aim of finding others like them to help protect the world from alien threats which may be more forthcoming now that everyone believes that Superman is dead. 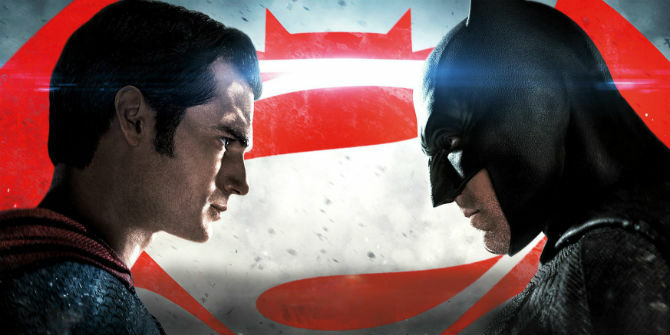 The sequel to Batman V Superman is planned for release in late 2017 and is entitled Justice League. This will introduce new characters into the team that Batman and Wonder Woman have created and may also see the return of Superman. If this film has got you in the mood for comic book action then you should check out the many DC themed slots that are available at Vegas Palms Casino for the chance to win a big jackpot.